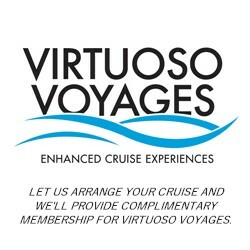 Complimentary, exclusive and unique Virtuoso Voyages event in Cairns. Click on Voyager Club tab for complete details. 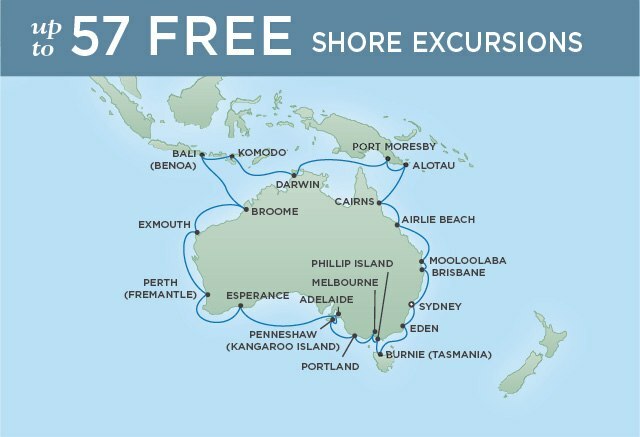 Regent Seven Seas Cruises offers free pre- or post-cruise land packages that highlight the treasures of exotic locations. Book a select Asia or South Pacific cruise vacation and enjoy a FREE 2 or 3-category suite upgrade and a $250 shipboard credit per suite. Limited time offer. 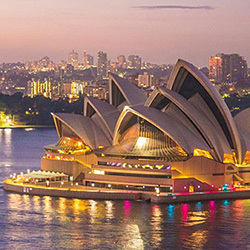 Enjoy a tour of Sydney's Northern Beaches and Sydney sights by land and view the Sydney Opera House and the Sydney Harbour Bridge on an exclusive cruise through Sydney Harbour. Embark on an expedition to the Blue Mountains. Experience expansive views of the spectacular Jamison Valley as you travel on the Scenic Railway. Visit the Three Sisters, an unusual rock formation representing three sisters who according to Aboriginal legend were turned to stone. Complement your voyage with an enriching land-based vacation, pre- or post-cruise, that reveals both the highlights and treasures of these exotic locales. Guests may choose one (pre or post-cruise) complimentary land tour package. 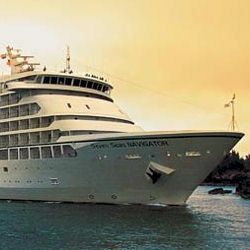 Regent Seven Seas Cruises reserves the right to change or withdraw this program at any time without notice. Programs are capacity controlled with limited availability. Book early to ensure availability. We'll begin with a scenic one-and-a-half hours drive from port in Cairns to Botanical Ark, a private ethno-botanical garden in the heart of the remote Daintree Rainforest. We'll meet with Alan and Susan Carle, who founded this tranquil oasis in 1983 to help preserve some of the world's most precious plant species, and to spread awareness of tropical ecosystems. Enjoy an interpretive garden tour and learn about the intrinsic link between rainforest plants and cultures, and see species that are extinct in their native homes. We'll finish on the veranda with morning tea and a very exotic fruit tasting. Next we travel towards the coast to Thala Beach Nature Reserve, a 145-acre eco-lodge and wildlife retreat. We'll enjoy a lunch of modern Australian cuisine in private Curlews Lounge, with stunning views of the tropical rainforest and the coastline. Suggested Attire: Casual attire and comfortable shoes.